From what I hear there used to be lots of songs around those masks.... Those have strong songs, they say, medicine.... In the Stick Dance, they use all those masks around the kashim [ceremonial house]. They made animals, all kinds of animals, out of sticks. This mask is similar to images of the Wild Man made in the Deg Hit’an region today. It has a spotted face, eyes with goggles, a rounded mouth, and earrings; the hair is caribou. A hanging ornament representing snot, now missing, would have dangled from the nose. The Wild Man appears during Giyema, the Mask Dance, and was formerly worn during the Stick Dance or Animals’ Ceremony. At the end of the Animals Ceremony carved sticks representing the souls of animals were placed in the river to release them back into the wild, ensuring that the animals would return to be hunted again. Alternatively, the mask can be identified as Cry Baby, a male Giyema spirit who wore earrings and female chin tattoos. Eliza Jones: This is about two and a half feet long, very thick wood. Phillip, do have a word for mask? Judy Woods: What do you call that? Eliza Jones: “Mask” is denaanaan’ edeetonee. Do you have any word for mask? Trimble Gilbert: No, we don’t make one like that. Phillip Arrow: This is very popular where I’m from [Shageluk]. I’ve made this kind of mask before, but this is way different than what I make. The nose and this [pendant at ear] are way different. They probably colored it [pendant at ear] too—supposed to be red. They had one [pendant] right there [base of nose], hanging down like that. They call it “snot” or something, but the Native word I don’t know. Eliza Jones: Bentseyh ts’aak’eneek’et ([something hanging out of this nose], my way. Are there feathers on there? Oh, that’s cloth [strap attached on back side]. Phillip Arrow: Cloth, yes. That’s for when they use it, when they dance. Eliza Jones: They tie it with that? Phillip Arrow: Right. Sure is short though, right? Judy Woods: It probably broke off. Eliza Jones: And the cloth looks like—I don’t know. Phillip Arrow: Mostly they used flour sack or something for string long ago. See this place right here [top]? Supposed to be feathers this way [extending out], from the swan. Eliza Jones: A swan feather? Phillip Arrow: Right, a long one. And then they tie feathers around the end with string. Eliza Jones: And the fur, do you think that’s caribou? Phillip Arrow: This is caribou, yes. Trimble Gilbert: Caribou usually have white [hair] from right here [neck], long. Phillip Arrow: That [mask is] very interesting. They call it “Wild Man.” I don’t know how come they call it that. We still use this kind. Phillip Arrow: I’ve a got song for it. Eliza Jones: Do you want to do the song? Phillip Arrow: Okay. [Sings.] That’s a Native song right there. We still use it—me and Raymond [Dutchman]. Raymond is my leader. We still use a few songs, about thirteen maybe. Eliza Jones: So in your area there are very few Elders now? Phillip Arrow: Me and Raymond, that’s all who’s left. Phillip Arrow: Yes, men’s. There are women’s Elders though. I don’t know how many, three or four. From what I heard, there used to be lots of songs around those masks. Different songs, you know, like medicine songs. It’s very powerful songs too on them. I used to use one of them, and my mom, she went over there, “Let me talk to the mask before you use it,” she told me. I said, “Mom, what did you say to that mask?” “I’m not—take it easy on your nephew” or something like that. So that’s the way it was long ago. Eliza Jones: So when you used it that one time, you borrowed it? Eliza Jones: What did you borrow it for? Was it for dancing? Phillip Arrow: You ever heard of Stick Dance? That’s the one that was going on that time [when borrowed mask for dancing]. Stick Dance—they used all those masks that we lost in the kashim [community house]. (2) They made animals, all kind of animals out of sticks. Eliza Jones: And this kashim, that’s all men and boys in there? Phillip Arrow: Right. But when women go in there, that’s only when they have a potlatch or bring [Eskimo] ice cream or something like that. There used to be—but I started to learn too late. I learned from Raymond all of what I know now. This [mask] is very popular though at my place [in Shageluk]. I’ve made few of these too. Eliza Jones: You have them around home right now? Phillip Arrow: Right now, yes. What I’ve made, that’s what we use. Eliza Jones: For your celebrations. Eliza Jones: What do you call it when you have a celebration like that? Phillip Arrow: It’s like a dead people celebration, when they have the celebration. Is that what they call it? The Native way [of saying it], I don’t know. Phillip Arrow: Yes, Mask Dance. The Stick Dance they dance at nighttime. That’s when the women come in [the kashim] too. Eliza Jones: So when they go in—the people that participate—they wear their masks? Phillip Arrow: Right. Women that stay wear mostly those handkerchiefs. Eliza Jones: Oh, bandanas that come way out here [cover face]. Phillip Arrow: Yes. You couldn’t look around. That’s what they wear, and they sit down where they’re supposed to sit down. Eliza Jones: And then the men come in wearing the masks. Phillip Arrow: Yes. There is danger too. They say not to come behind [the mask wearers]. Phillip Arrow: Behind the masks. Eliza Jones: —because there’s a lot of power to it. Phillip Arrow: Right. That’s the way it used to be. Eliza Jones: So when they go in the hall wearing the masks, did everybody sing the same song or do you come in singing the song? Phillip Arrow: No, I’ve never see it like that. They just—on account of those songs on the masks, maybe that’s what made them do it. Suzi Jones: So, is this still going on today or were you talking about when you were young? Phillip Arrow: That’s when I was young, yes. Suzi Jones: But no more today? Phillip Arrow: I’ve never seen them do that anymore. Because now, no songs on those masks. But I still believe in those songs. And I always have respect for that mask. Raymond is same way, because we have respect for how many dead people used to use this [mask]. So we treat it like a person. I still believe in lots of things, because of my mom. She knew lots about long ago. Eliza Jones: I know in Nulato, when they had a Stick Dance, after everything is over, the next day they walked around town and sang this song at each house. Gee, how did that song go? I don’t remember how that song goes. They go to somebody’s house, and they mention something that they think that person might contribute—only thing I can think of right now is canned food. [Sings]. And then they would go like this [up and down] with in recent times I guess it was canvas, and then that person would go out and contribute something. They went all around town, and they collected food like that. And then in the evening, they would bring all that food to the hall, and they would have a covered dish [potluck]. And then they put a canvas all the way across the hall, and people came in with masks and did dances. Trimble Gilbert: I think our people learned a song like that from Stevens Village. Johnny Smoke and Simon Grant, he used to live in Ft. Yukon, they went up to Arctic [Village], and they went around with a blanket and sang with it. And before the celebration, what they needed, they collected. People donated stuff. Sometimes what they needed was sugar or tea. I remember that song they sang—my mother was always singing that: “Ee sugar, jìi ee lidii èejìi, èe sungąįį eejii, èe sungąįį, jìi t’ee lidii ee jìi, aii sungąįį èejìi [this sugar, this is tea, this is sugar, this sugar, this is tea, that sugar] . . . People listened to the song and [learned] what they needed, so they just threw it in there [blanket]. So they went around to every tent, every house. That was a good one. They were still doing that not too long ago. Judy Woods: Up in Minto, they did that at New Year’s. Eliza Jones: Yes, New Year’s seems like the time they did that. My uncle, Chief Henry—he was born maybe 1898, somewhere around there—he said when he was a young boy his family—because there was no food around the Allakaket area—they traveled overland to the Stevens Village area. And then that’s about the time they said the White people came. And so they stayed on the Yukon for three years, and he talked about doing that. They called it k’ekkaał [blanket used in mid-winter festival]. (3) At New Year’s, they went around with this k’ekkaał. They sang that song at each house, and they threw stuff in there. Judy Woods: They used a sleigh too. Eliza Jones: Yes, they had a sleigh with a cover, and they threw the food in there. Trimble Gilbert: Well, another story is how those people are very smart. They prepared way ahead of the time. In the summertime, I remember they were out in the field hunting. They made dry fish and dry meat. They stored it way up in the cache and put the best food in there—maybe lard and blueberries, all the best parts of the dry meat. And then when the holiday was coming, they knew what was going to happen, so they all came back to the one place to celebrate. That’s the time when they brought in all the food, so they knew what they were donating. So it happened all the time. I remember that. Lots of good stuff, and they just threw it in there. Sometimes they got too much, so the toboggan was with them, because with the blanket you couldn’t carry too much. So it was a lot of food donation. Judy Woods: Good food too. Eliza Jones: So, on the masks that you see and make, did it always have something like this [pendant at ear]. Phillip Arrow: Right. On the ones I make, it’s red. This one [pendant at base of nose] hanging down is red. Eliza Jones: Does it always have to have that shape like that? Phillip Arrow: Yes. This is a long type, but you can make short ones too. Eliza Jones: Do you always use the same color? Phillip Arrow: It’s supposed to be white right here [spots on forehead], and these spots right here [on face] are blue or brown or something. This is real nice though, the way they made it long ago. But that new style is my style. Eliza Jones: Right now when you make the masks, what kind of wood you use? Phillip Arrow: I use [tree] stump and that soft wood. Phillip Arrow: Cedar, that’s soft wood. That’s what I use mostly, because it’s easy to carve. Eliza Jones: But a long time ago they used? Eliza Jones: Stump. And those are very hard wood. Phillip Arrow: Right. You had to chop all day. You had to be patient. Eliza Jones: So they could make it different shapes? Phillip Arrow: No, this is what they call noxtth’og [glasses]. That’s same way I do it too—over the nose, like when you wear glasses. Phillip Arrow: Long ago they used to make lots of masks. And when they made that airfield in Shageluk? When they first made it? And you know a fish trap? One of them full [of masks]—we lost the whole thing when they made that airfield. Somebody took it, I guess. That’s all I could figure. Eliza Jones: You had it stored somewhere? Phillip Arrow: It was always hanging up on a tree, a spruce tree. Eliza Jones: Oh, at the base of a spruce tree. The traditional way of storing was to tie something at the base of a tree, so that when it rains, it keeps it out of the rain. Right? Phillip Arrow: That’s right. That’s the way they used to do it. My mom always told me, “Don’t go near that place,” because she knew what tree. Eliza Jones: Oh, where the masks are stored. So traditionally, a long time ago, did they make new masks every year? Phillip Arrow: Yes, every year they make—but these ones we lost were made out of elephant bone, like hip bone or something like that. Eliza Jones: Oh, the mastodon. 3. K’ekkaał is described in Koyukon Athabascan Dictionary as follows: “The custom is observed in most of the [Tanana] villages, of going around in a crowd to solicit contributions towards a festive dinner, on Hew Year’s Day or thereabout. The men, mostly younger ones, go about the place carrying a blanket or any substitute for a blanket. They stop at the door of each cabin, holding the edge of the blanket all around and shaking its middle up and down while singing ‘hubet okko hodee, hudnee [for the stomach, where is it, we say]‘ repeated several times. The master of the house is expected to come and throw some food in the blanket. The gift is tossed up a few times, and they proceed to the next house. . .” (p. 322). Elder Phillip Arrow of Shageluk identified this as a Wild Man mask, a type that is still made and used in the Deg Hit’an region. It has a spotted face with blue forehead and chin, goggle eyes, a rounded “O” mouth, long earrings, and a straight nose. White caribou hair is affixed to the head. Mr. Arrow said that a dangling ornament representing “snot” would normally hang at the end of the nose. The snot piece is missing but a peg hole for attaching it remains. Anvik residents in the 1930s made this type of mask, but called it the Cry Baby. (1) The Cry Baby was a character who appeared in the annual Giyama [Mask Dance] and was said to live inside a mountain. (2) The being was male even though it wore earrings and other female ornaments. 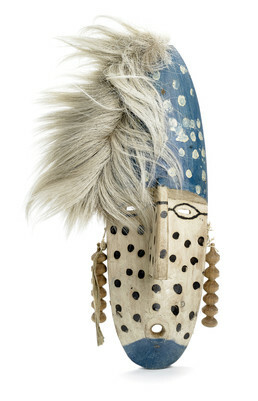 On the mask shown here, the blue-painted chin may indicate a woman’s facial tattoos. (3) According to Osgood, the O-shaped mouth of the mask was to show that the Cry Baby cried all of the time, a sound (“xu’xu’, xu’xu’”) that was imitated by the dancer who wore it. For the Deg Hit’an, the Stick Dance refers to three foot-long sticks of wood called “animal souls,” each carved to represent a different creature, that supported ceremonial ceiling hoops inside the kashim (‘ceremonial house’) during the three weeks of songs and masked dancing that comprised the Animals’ Ceremony. (7) These soul sticks were released back into the wild at the end of the ceremony by placing them in the river or on the river ice where they would be carried away in the spring. The purpose of this lengthy mid-winter ritual, originally taught to the people by a shaman, was to seek the favor and abundance of animals and plants that were needed to feed the community.